Two years ago, fresh off our move to Germany and luxuriating in the fact that it was now geographically possible to "pop up" to Sweden on a whim, Johan and I flew to Stockholm to attend the 2016 Ostfestivalen. The Swedish Cheese Festival is an annual event to celebrate, well, Swedish cheese. Since 2014, cheesemakers from all around the country have journeyed to Stockholm each February to participate in this delicious trade show, offering samples and and conversation to festival-goers keen to learn more Sweden's fantastic cheeses. 2016's Ostfestivalen was held at the Nordic Museum, which is one of my favorite buildings anywhere in the world, and the event was everything I could have hoped for. I tasted more incredible cheeses than I could count; I found myself as flustered as a teenager meeting a beloved celebrity when we approached the Västerbottensost booth and they were harvesting fresh, golden-white shards of cheese from the innards of a huge wheel; and I had the very palate-validating experience of voting for the cheese that ended up winning the popular vote that year—the crystallized, fruity (think pear, maybe quince, with a hint of citrus), slightly nutty and fully complex Gårdsost from Svedjan Ost. We'd also signed up for a champagne and cheese pairing seminar, which was every bit as delightful as you'd imagine, despite understanding approximately 3% of the lecture due to my extremely halting Swedish. Suffice it to say, I was eager to return to the cheese festival this year, which is precisely where we spent Saturday, 17 February. 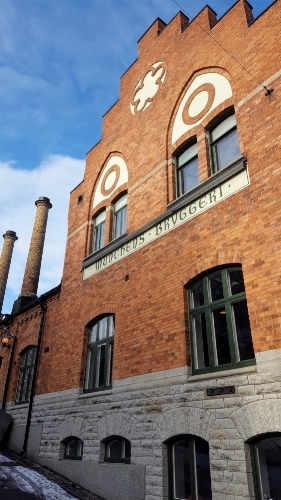 The venue had since been changed to Münchenbryggeriet, which proved quite functional with its multi-room layout and lovely waterfront location on Stockholm's Södermalm island. "It smells like cheese in here," Johan remarked as we climbed the stairs to the event hall after checking our coats. No question we were in the right place, then. My enormous scarf and I hanging out with ICA's new "people's cheese." Clockwise from top left: A champagne-infused, 12-month aged cheese from Falbygdens; Västerbotten's extra-aged 24-month; a halloumi of which unfortunately did not catch the name; and Västerbotten's extra-aged again, this time circulating amongst spectators of a talk by the cheesemaster himself. At 1 PM, Thomas Rudin, Västerbotten's Ostmästare, led a chat on the mystique of this remarkable cheese and its inability to be replicated anywhere other than Burträsk, Sweden. This was a talk I very much wanted to attend despite my limited comprehension of Swedish, and I'd brought along a digital voice recorder in hopes of giving myself the opportunity to decipher the content later. So I'm standing in the back of the crowd, half-listening and half-focused on crafting an Instagram post, when I notice Johan waving his arms around and Mr. Rudin pointing directly at me. I was somehow under the impression that J had been indicating our interest in the tray of cheese samples, but he was in fact volunteering me as one of three guest participants in this mini-seminar. Next thing I know, I'm standing on stage with the cheesemaster of the cheese that sparked this passion of mine for svensk ost in the first place, awkwardly tying on a leather apron over my huge scarf, handbag swinging at my side, the woman hosting the talk inquiring "Vad heter du?" and me sputtering my name and a disclaimer that min svenska är inte bra. I'm equal parts exhilarated and mortified. Thomas Rudin speaking, before I came along to make things weird. The conversation of course continues in Swedish, but the honorable Mr. Rudin does me the kindness of occasionally switching to English to clarify when it's my turn to act. Unfortunately, my understanding of the context of these requests was rather limited, so when he asked me to "choose a number between 1 and 5" and I thought that perhaps we were playing some sort of a guessing game, it was by sheer luck that I choose the number 4 as I later learned that I was actually giving a rating to the aesthetic quality of the wheel of cheese sitting before us. He agreed with my rating, though, so I think I was subconsciously on to something. Next, we used an aptly named "cheese trier" extractor tool to sample pieces of the inside of the wheel. This was a real joy for me, plunging the trier into the side of the cheese, twisting it 360° and extracting a perfect cylinder of fresh Västerbottensost. Mr. Rudin instructed me to break off the end and plug the hole I'd created, and the rest of the piece was for sampling. We smelled, tasted, and squeezed to assess texture and flavors, just as actual cheesemakers do to determine when a wheel is ready to come off of the aging racks and be readied for sale. At the end of the demo, apron in hand (I was so elated that we got to keep the aprons! ), I floated back over to Johan to express my glee and fill the gaps in my comprehension of the event. I also approached Thomas Rudin once the crowd cleared, apologizing for my lack of Swedish proficiency and gushing something about this being the greatest day of my life. Another major highlight of Ostfestivalen 2018 was having the chance to briefly chat with Matilda and Johanna Hellström of Svedjan Ost, the winning cheese of 2016 that I've been daydreaming about for the last two years. Turns out, their exquisite Gårdsost also won the popular vote in 2017 and, no surprise, they won again this year! To wrap up the afternoon, Johan and I attended Saturday's wine and cheese pairing seminar. 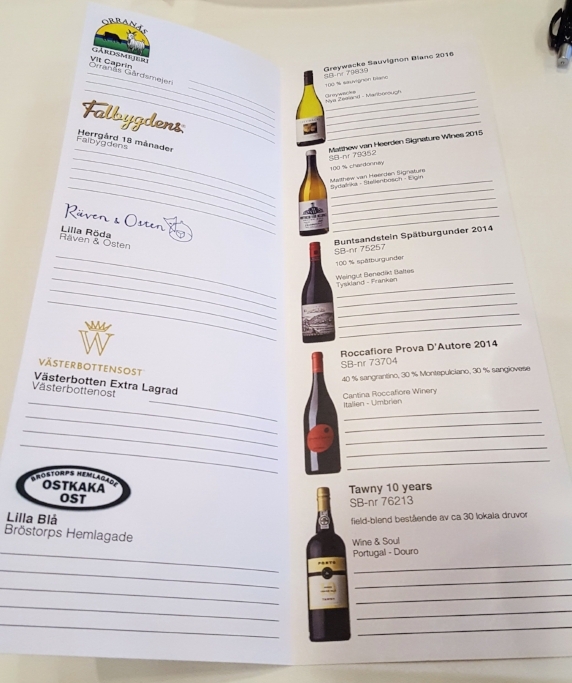 We sampled five cheeses and five wines; all cheeses from Sweden—naturligt—while the wines were a diverse lot from New Zealand, South Africa, Germany (Franconia, even! ), Italy, and Portugal. We left the festival with seven glorious pieces of cheese to take back to Nuremberg and heaps of inspiration for my upcoming Swedish cheese project—more on that to come! And a quick restaurant tip if you find yourself in Stockholm: Johan and I had a sublime meal at Rolfs Kok following Ostfestivalen. I was too busy delighting in the perfectly executed food and reminiscing over the wonderful day of cheese to think to take photos until it was too late, but make sure at least one person in your party orders the pork confit and is generous enough to share a bite or three... It's been over a week and I'm still thinking about the luscious crunch of crackling atop juicy, fall-apart pork, the tangy sauerkraut, beer-braised jammy onions, and roasted garlic. The balance of fat and acidity, salty and sweet in this dish was just :chef kiss: perfekt. Til next time, Stockholm. Vi ses!